MAY 11 - Adam begins filming the feature "BETWEEN THE SILENCE", playing the role of JONATHAN, directed by Luke Moss for Wig In A Box Productions. 28/04/11 - Adam has provided voice work on a podcast for THE STAGE - "RODGERS & HAMMERSTEIN IN LONDON" narrated by Helena Blackman and with contributions by Sir Cameron Mackintosh, Stephen Sondheim and Mark Shenton. Click here to listen to the podcast. 04/0411 - Adam recorded a voice over for a NATIONAL DEAF CHILDREN'S SOCIETY DVD on football coaching. To find out more about the NDCS, click here. 20/10/10 - Adam has been nominated in the BEST MALE PERFORMANCE category of the OFF-WEST END AWARDS (THE "OFFIES") for his role as MAURICE HALL in "MAURICE". Click here to register your votes for his performance before 31 DECEMBER 2010. Winners will be announced at an awards ceremony on 27 FEBRUARY 2011 hosted by Simon Callow. Casting is now complete with JESSICA LUCY taking the role of ADA. Rehearsals start this Saturday before opening on SATURDAY 4 SEPTEMBER. Book your tickets NOW! 30/07/10 - VALERIE CUTKO (National Theatre's "MY FAIR LADY", "CABARET" directed by Rufus Norris, Warner Bros' "THE PHANTOM OF THE OPERA") joins the cast of "MAURICE" in the role of Mrs Hall together with ANNA GILTHORPE (BBC3's "THE GEMMA FACTOR" and "BLINK TWICE!") as Anne Woods. 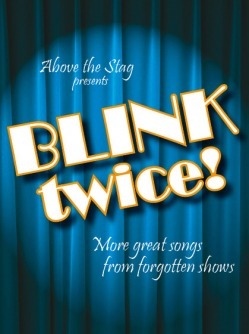 30/07/10 - "BLINK TWICE" has now opened at ABOVE THE STAG THEATRE and the reviews are coming in. Read Mark Shenton's review in The Stage. 07/07/10 - Casting on "BLINK TWICE!" is now complete. Adam will be joined by ANNA GILTHORPE (from BBC3's "The Gemma Factor"), ASHLEIGH JONES, EMMA LUMSDEN and REED SINCLAIR. Performances begin on 27 JULY for a strictly limited season. Adam will be returning to the ABOVE THE STAG THEATRE before his reprisal in "MAURICE" to perform in the revue show, "BLINK TWICE!" - the follow-up to last year's hit "BLINK! AND YOU MISSED IT". Devised by Peter Bull and Tim McArthur and directed by Tim McArthur, the revue is a compilation of showstoppers from musicals you missed including hidden gems by Jerry Herman, Andrew Lloyd Webber, Stephen Sondheim, Kander & Ebb and more. Performances begin from 27 JULY for a limited season until 22 AUGUST. Tickets are £12 (31 Jul to 1 Aug); £14 (2 to 22 Aug) and £20 for the gala opening night on 29 July. Book your tickets now! 12/06/10 - Tickets are now onsale for the restaged production of "MAURICE". Tickets £14 (Previews 4 & 5 Sept: £12; Gala opening night 6 Sept: £20 incl. after-show party with cast). Book your tickets NOW! 21/05/10 - Missed WEST END EUROVISION? Check out Sister Mary McArthur and the Jermyn Street Theatre's performance here. The troupe came a very creditable 7th beating Avenue Q, Love Never Dies, Les Miserables and Dreamboats & Petticoats, receiving top marks from Mr Duncan James and the only standing ovation of the night! Well done, Sister Mary! 19/05/10 - Following its sell-out success in March this year, "MAURICE" is returning to ABOVE THE STAG THEATRE. The restaged production will begin previews on SATURDAY 4 and SUNDAY 5 SEPTEMBER, and will run for a limited period until SUNDAY 26 SEPTEMBER. Original cast members, including Laura Armstong, Gavin Dobson, Alec Gray, Jonathan Hansler, Persia Lawson, Adam Lilley, Leanne Masterton, Stevie Raine, Rob Stott and Gil Sutherland, return for the run. "MAURICE" has been nominated for three OFF WEST END THEATRE AWARDS including Best Performance and Best Play. 11/05/10 - Adam has been nominated in the Best Performance category of the Off-West End Theatre Awards for his role in "MAURICE"! The production has also been nominated for Best New Play. Voting is open to the public from 15 September onwards to so please visit the site and register your votes from that date! The awards are due to be held in January 2011.
and further dates throughout June to be announced. 09/05/10 - Adam is appearing as part of the team representing the Jermyn Street Theatre at "WEST END EUROVISION" at the Piccadilly Theatre on Thurs 20 May at 11.30pm. In aid of THEATREMAD. 24/04/10 - Adam is quoted in an article in this week's THE STAGE on Twitter in the arts. Click here to read the article. 23/04/10 - Adam is putting the finishing touches to the talking book "RING OF FIRE" by Rick Broadbent for the RNIB. 04/04/10 - "MAURICE" has now closed after a hugely successful run. Thanks to all who came and supported the production.